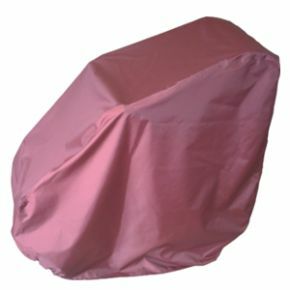 Electric Wheelchair Cover Waterproof For Outdoor Use. This cover will fit either a manual or powered wheelchair unfolded. It may be used as a dust cover or for use outdoors as it is fully waterproof. I received the cover the day after i ordered it and it was just as advertised. I am very happy with my purchase and would recomend this site to my friends. This is the 3rd one I have bought, my chair is outdoors 365 days a year and is subjected to ice and snow in the winter and blazing sun in summer so eventually it perishes and tears easily BUT the last 2 have survived for 2 yrs and at the price I consider this to be very good value.It always keeps my chair dry, and delivery only took 2 days. Highly recommended. Excellent Cover just what we needed for our sons electric wheelchair. Fast friendly service. This is a great product, fitted over my electric wheelchair perfectly. Superb lightweight waterproof cover at the right price. thank you.